Recently separated from her husband, Alice Kinney (Reese Witherspoon), decides to start over by moving with her two young daughters back to her hometown of Los Angeles. Struggling to get her fledgling interior design career off the ground, Alice tries to navigate the family’s new life. During a night out on her 40th birthday, Alice meets three young, charismatic filmmakers (Nat Wolff, Pico Alexander and Jon Rudnitsky). With a little prompting from her mother (Candice Bergen) she allows them to stay in her guest house as they try to get a break in Hollywood. Before long, an unconventional family dynamic emerges, leading them all on an unexpected journey. Home Again asks us to sympathise with a woman who lives an incredibly privileged life. After leaving her husband (a slimy and yet, somehow, still likeable Michael Sheen), Alice has the luxury of moving into the palatial LA home of her late father. She redecorates (of course) and life is wall to wall gorgeousness. All fairy lights and throw pillows, large glasses of wine and warm outdoor dinner parties. It should, of course, be hard to pity Alice. Or it would be if she wasn't portrayed by the always engaging Reese Witherspoon. In the midst of an (albeit minor) existential crisis, Alice lets loose on a night out to celebrate her birthday. There she meets three men - Teddy, Harry and George - who become for all the world like her three fairy godmothers (or whatever the handsome, young, male version of this trio would be). Actor, Teddy, is a great cook and George (a stand out turn from Jon Rudnitsky) is a sensitive writer who helps Alice’s daughter, Isabel (Lola Flanery), with her anxiety. Meanwhile, romance blossoms between Alice and Harry, a struggling film director. You see what Hallie Meyers-Shyer is trying to do a mile away and the film gives you plenty of opportunities to roll your cynical eyes and sneer. 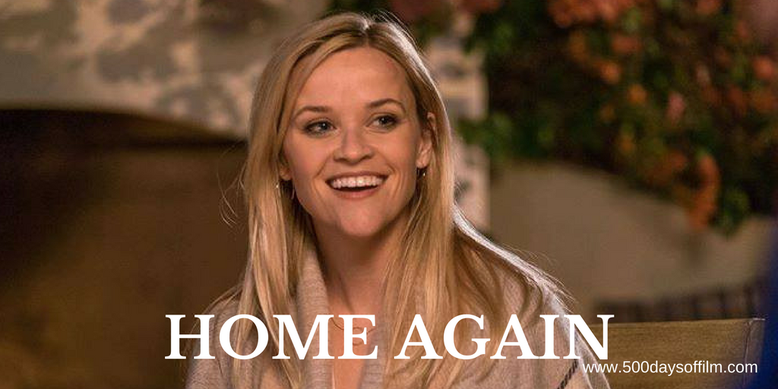 However, while the story doesn’t completely satisfy, Home Again is an enjoyable couple of hours of pure escapism - largely thanks to Reese Witherspoon’s bright and charming performance and a script that has several smart (and often insightful) comedic moments. Meyers-Shyer's film exists in a fluffy fantasy world and I, for one, have no problem with that... every once in awhile. My biggest complaint about Home Again is that it doesn’t have nearly enough Candice Bergen… she is such a wonderful screen presence. Hallie Meyers-Shyer is the daughter of director, Nancy Myers (The Holiday, The Intern, It’s Complicated) and writer/producer, Charles Shyer (The Parent Trap, Father Of The Bride, Private Benjamin). Have you seen Home Again?